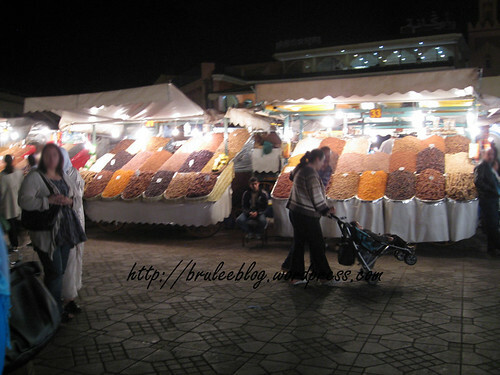 The place is packed with people and becomes a sea of stalls, lights, and smoke. 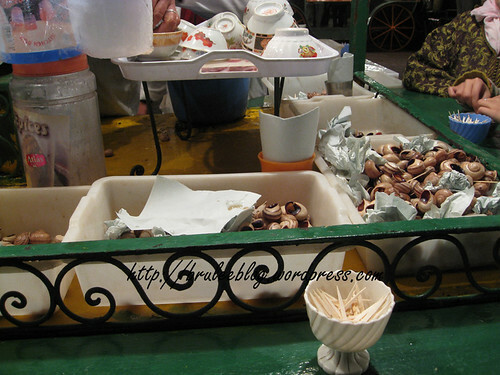 The first thing I tried at the night market were the snails cooked in an anise and hot pepper broth. The smell of anise wafted through the air surrounding the stall. 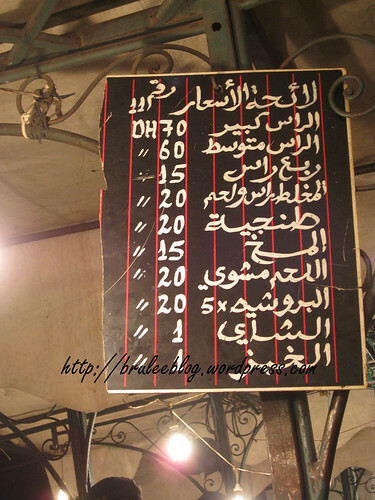 A small bowl cost 5 Moroccan dirhams (about 60 cents in Canadian dollars), and a large bowl cost 10 dirhams (DH). The snails were fresh and tender. The soup had a full, deep flavour. The anise, while strong, was not overwhelming at all and the small bit of spice from the hot peppers gave the soup a bit of bite. 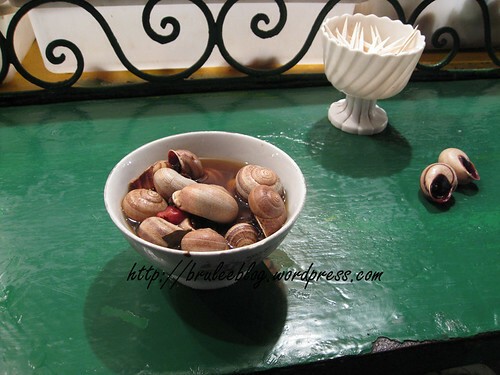 You used the toothpicks to pull out the snail meat, and once you were done you could drain the bowl of broth. Once people were finished eating, they dumped their shells in the bins provided and used pieces of paper to wipe away any spills. The next thing to try were the sheep’s heads. 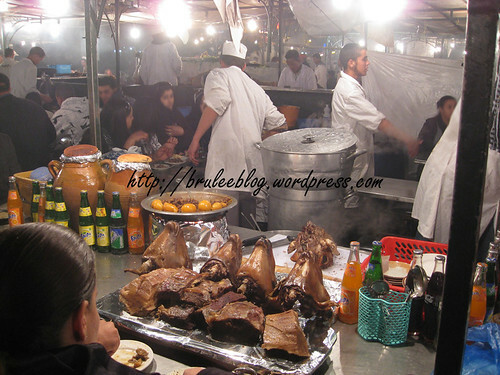 Mutton is a staple food group in Morocco. I kept mistakenly saying “lamb” and getting corrected because the sheep in all the tagines that we ate were mutton, not lamb (old sheep vs young and tender sheep). It makes sense when you think about it. Tagines are slow cooked stews, and old, tough meat needs this kind of cooking to be tender enough to eat. Mutton tagine with potatoes, vegetables and preserved lemons. 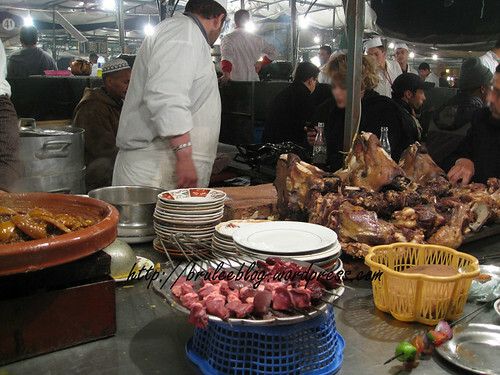 Some of the sheep’s head stalls also offered grilled offal brochettes (kebabs). I wanted some, of course. This guy would stick his hand into this steaming pot and pull out meat. No spoons or heat protection required. I wonder if he has any feeling left in his hand…. 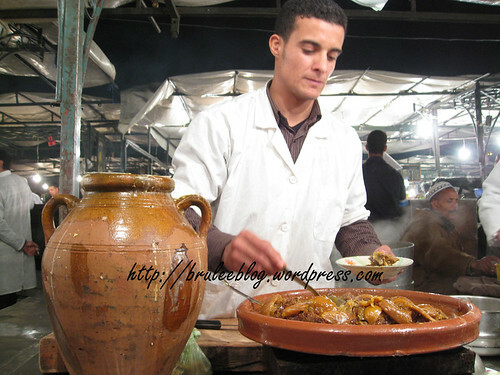 Once the meat is removed from the pot or the tagine, it is shredded and placed on a plate for your enjoyment. 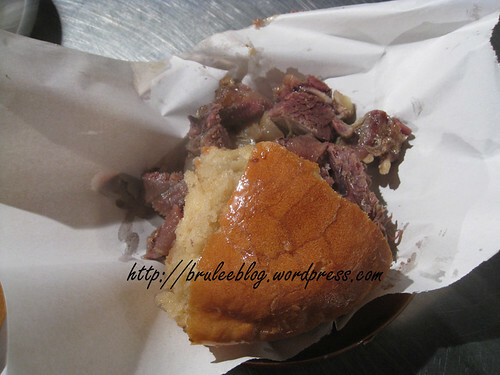 And served with a piece of khobz to soak up the grease and meat juices, of course. 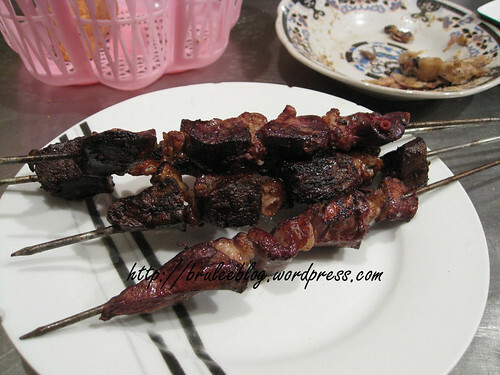 The offal ended up being more on the charred side rather than the light grilling that I was expecting. It was overcooked and not as enjoyable as I had hoped. You could order specific parts of the head to eat. The cheek was a desirable part (and I think more expensive too), and was served with some cumin salt as a dip. 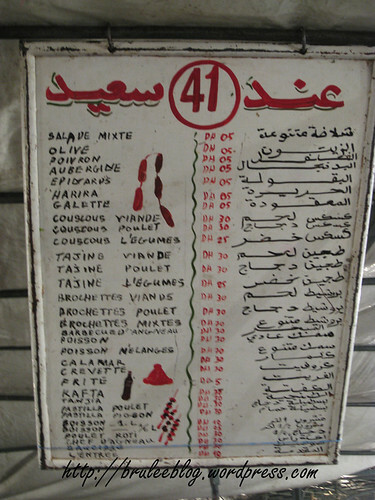 A mix of cumin and salt is a pretty common condiment in Morocco. 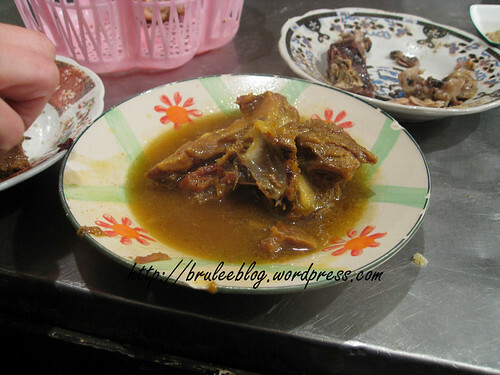 This sheep’s head piece was from the tagine and came with a lot of broth. 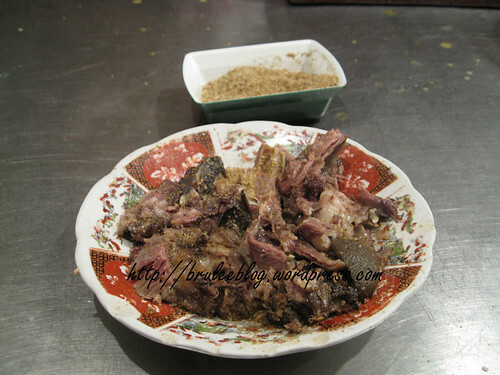 Taste wise, all three different servings of sheep’s head were tasty in slightly different ways. All were relatively tender, with the cheek being the most tender. The first plate was more fatty, and the last one was more like picking meat out of a stew. All of them tasted relatively fresh and didn’t have any of that strong gamy taste that sometimes you find when eating sheep. A few busy stalls were selling eggs and bread. I guess simplicity is key here? I couldn’t figure out what the attraction was, but they were doing a brisk business with the locals. And yes, there were a few tourists around too. 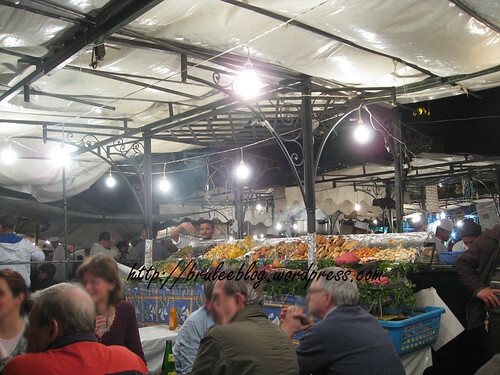 But they were mostly as the seafood, cous cous and tagine stalls. The only locals I saw at these ones were the people working at the stall. We wanted a few vegetables to go with our meal so we did stop at one of those stalls. 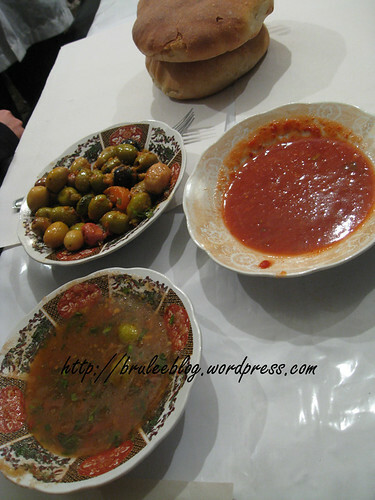 They gave us khobz, olives and a couple of tomato-based dips as appetizers as soon as we sat down. 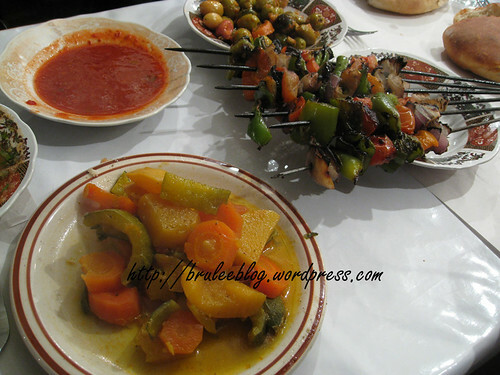 The vegetable tagine and vegetable brochettes were good, but nothing too unique. 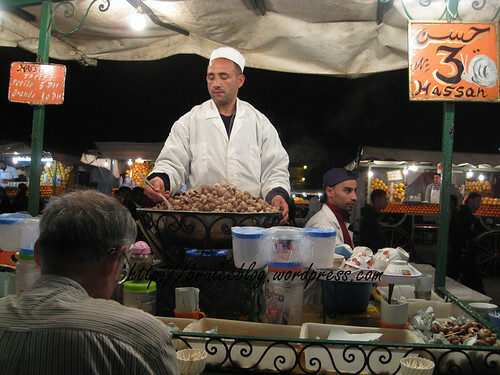 Food in Morocco doesn’t go to waste and people don’t go hungry. 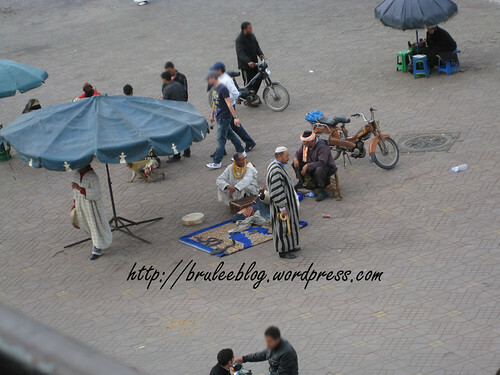 Beggars in the streets are usually given enough money to afford some bread. 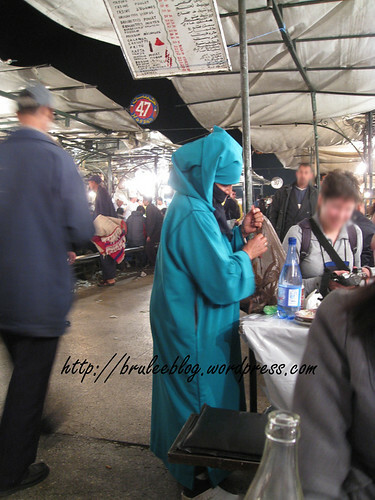 At Djemaa el Fna, kids ran around selling packages of tissues, and some people, like this woman, would collect people’s leftovers and put them in a plastic bag for herself. 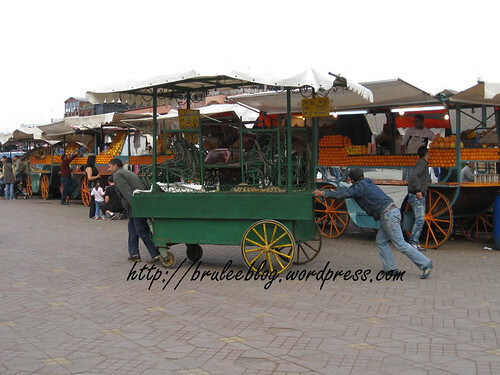 A lot of stalls would give beggars some leftover khobz too… or even in some cases whole loaves. To round out our meal, we went to a cinnamon tea stall. There are a whole row of them side by side, and apparently each one has their own special variation of the recipe. The main ingredients are posted on signs at the booth. 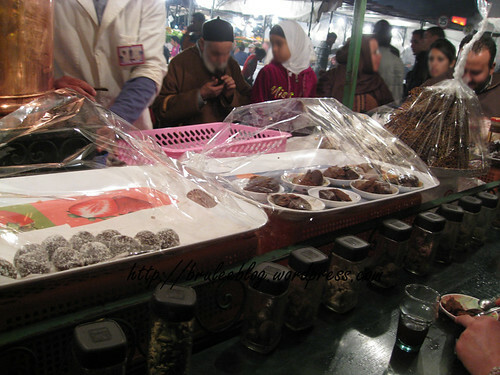 The tea kept piping hot in giant copper kettles, and the stalls also serve desserts. A sample of the many spices that go into the cinnamon tea. It looks rather unassuming, I know. 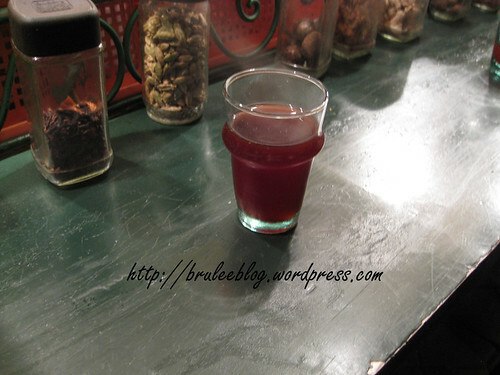 The cinnamon tea is a deep red colour. As I said before, it is served hot; you can see the steam coming from the glass. It’s not as thin as water but it isn’t a thick drink either. The smell is similar to what you might experience when standing over a big pot of mulled cider or wine. The taste though… it’s hard to describe. It’s spiced very strongly. So strong that you can only take small sips. Cinnamon is the main flavour here, but you also get a hit of the ginger. The ginseng gives this another layer of flavour. I liked it a lot, but I barely finished one glass because the amount of spices in it was just too overwhelming to my senses. 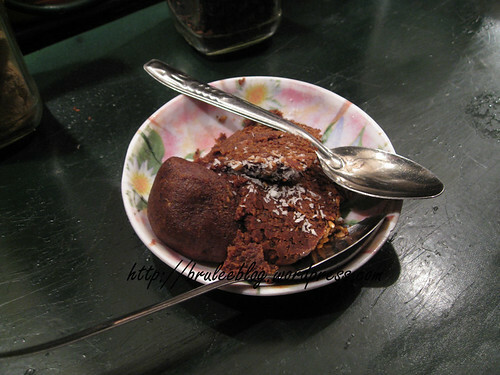 We also had some spiced cake to eat. I don’t know the actual name, but I tasted cloves and coconut in there. It didn’t attract me at all, but in hindsight I wonder if that is because I was too busy marveling at the spices in the cinnamon tea. 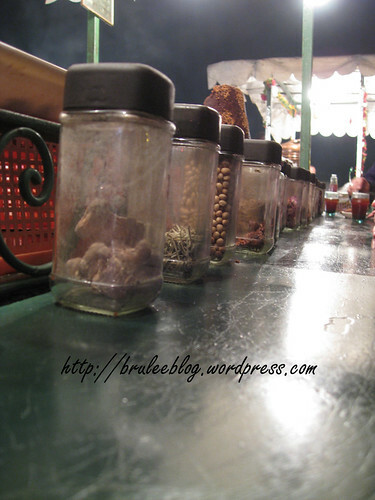 Djemaa el Fna was one of my trip highlights. We actually were here three times – two times on two different nights, and once during the day. The visuals, the scents, the atmosphere and the flavours combined to make it an experience that I won’t forget anytime soon. 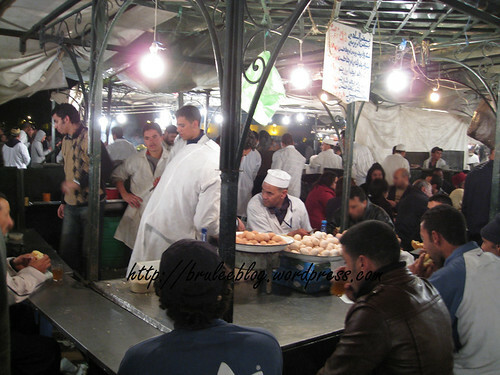 If you ever go to Morocco, make sure to stop here at night and try the snails and the cinnamon tea, and of course, the sheep’s head. Great post and pics! I would have mauled that doughnut seller! What an incredible experience. I will get there. If I live long enough. Egypt and Spain are on the short list… and this accompanies both… What lovely food… yet, were you worried about cleanliness? If that young fellow was pulling hot meat out of the tagine without any hand covering – and I see the bread laid on the table… etc. I would DEFINITELY want to try everything, but would need to know it was safe. 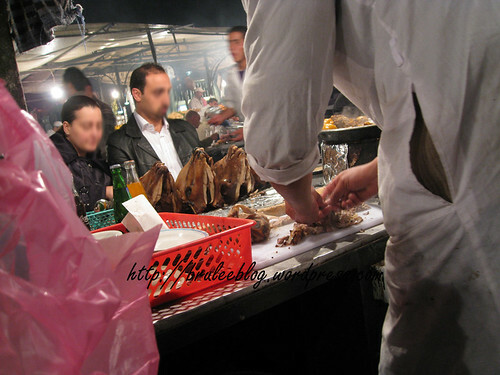 Were you there with a local – or how did you know you were eating offal? The signs were confusing enough to me. Do enough people speak English? I detest mutton… but, your description sounds delicious. Remember when I told you about Stephanie L’s blog – and you commented – well, they went out at night. Did you stay right above the market – or how did you feel safe? I also did NOT know about the other level of UNESCO Heritage Sites. I have a list of the physical ones and am checking it off as I travel. I will have to google the other one. Brilliant idea, and really appreciate this learning experience. We were there with our hired guide, Mark. 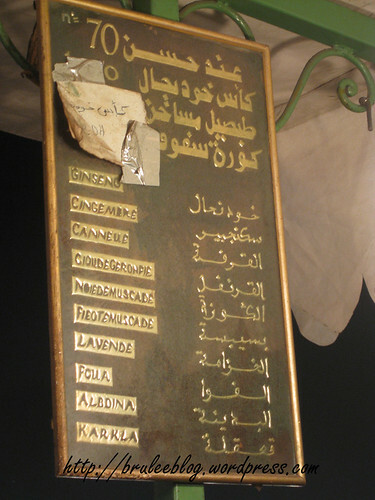 People in Morocco speak Arabic and Berber. Some speak French. There is little English spoken. 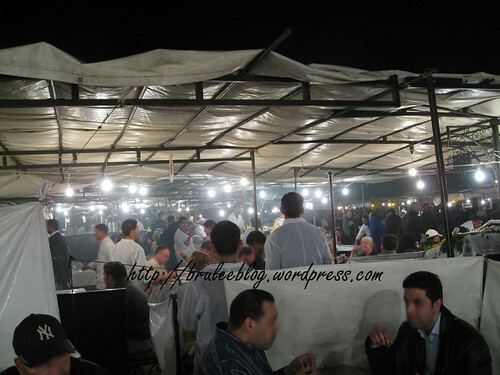 We stayed about a 10-15 minute walk away from Djemaa el Fna. I probably would be unsure about walking there myself at night but it is do-able. 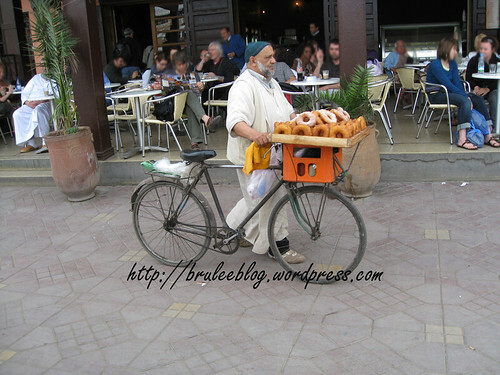 The medina (the first Morocco post) we were in often had someone who could deliver people to restuarants, etc. if they needed help, but since we had Mark we didn’t need that at all. The raw stuff definitely looked like offal but Mark confirmed this for me. One of my friends doesn’t like mutton either but said that the ones we had didn’t taste gamy and enjoyed it. I didn’t feel worried about the cleanliness of the food because you could see all of it being cooked in front of you as opposed to a restaurant kitchen where food is cooked out of sight. All the stalls we ate at were very busy and you know locals aren’t going to eat somewhere that gives people food poisoning. 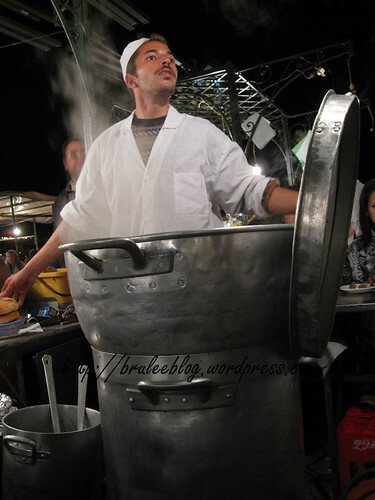 The guy with the hand in the pot – that pot was SO HOT it probably sterilized his hand over and over. Also, he wasn’t handling the money at all, just serving food. I was in Morocco for 10 days and never once got sick. I understand your concern for cleanliness but fresh meat that was killed just hours prior does triumph the packaged, steroid-filled meat we are used to in our homelands. The bread on the table is not a big deal, and rarely would something like bread make you sick (unless there is visible mold). It is easy to spot the food that you would not want to eat. 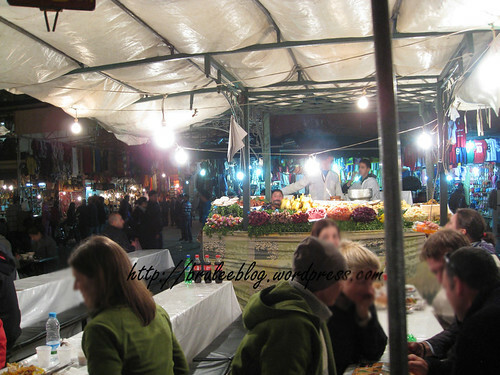 For example, there are small stalls that have bowls of food sitting at atmosphere temperature. There are clearly eggs and meat (aka things that easily spoil) in these dishes so I would stay away from them. As for the language barriers, I did not find this troublesome. The only place that presented some challenge was at the very northern tip of the country in Tangiers. Luckily my gringa Spanish skills helped me get by, but other than that I was always able to communicate with the locales. One vendor even took credit cards for my jewelry purchase. 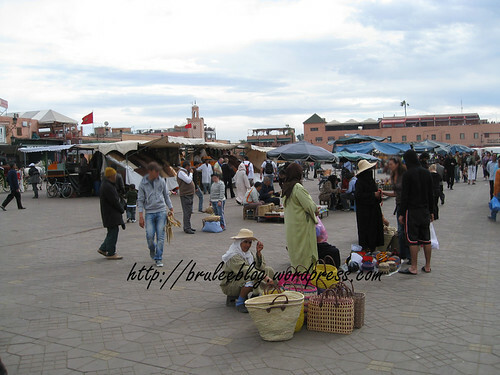 I absolutely love Morocco and can’t wait to go back! I am really enjoying your Morocco posts. We are planning to go next spring. I was worried about veggie food over there, but it is really nice to see vegetable and bean tagine and couscous up on the menu you posted. The cake looks lovely – glad to see I won’t have to miss out on desserts! Neither of us are fans of olive, but we are working it!! I still dream about the oranges I had in Morocco. And the olives – they are more mellow than the ones you usually find here. Especially the white and pink ones. Definitely try them! 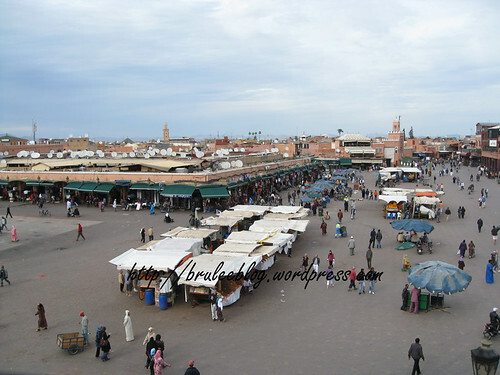 Hi.. Im planning a trip to marrakech. Your experience sounds wonderful. I was wondering if u tried out any hammam and if so what would be the price to pay? Also did you make a trip to the Atlast Corporation Studion in Ouarzazate? Any reasonable excursions? thanks..
We didn’t try out any hammams because some of us weren’t feeling well through the trip. I am told that it is an experience that you should definitely try though! 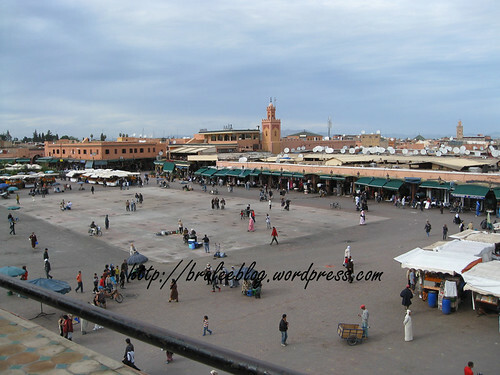 We did go to Ouarzazate, but we were only there to stay overnight and didn’t go to the studios or explore the town at all. We spent more time in the mountains instead (photos and blog entries of that part of the trip is to come).